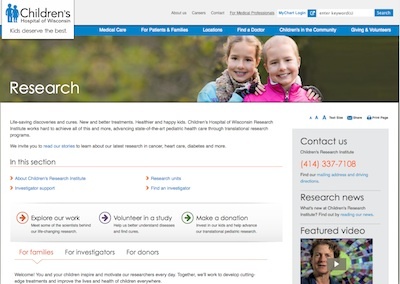 Facing a major website redesign, Children’s Hospital of Wisconsin asked for my help revamping the research section of its site. I analyzed more than 100 existing web pages and recommended which ones should be deleted, moved to the intranet, rewritten or reorganized to better serve the website’s key audiences — families, medical professionals and prospective donors. I rewrote the research landing page and created other new pages, and I interviewed some of the hospital’s top researchers for a series of profiles that showcased the fascinating research happening in pediatric cancer, heart care, diabetes and other areas. I also revised existing content to improve readability and search engine optimization. It was an interesting and rewarding project, and I was proud to help tell the story of one of the nation’s top-ranked children’s hospitals. Who am I? A former journalist turned marketing writer. An AP Style devotee. A lover of Milwaukee, old houses, cats, chocolate and Masterpiece Theatre (not necessarily in that order). Here's my life story in 200 or so words.